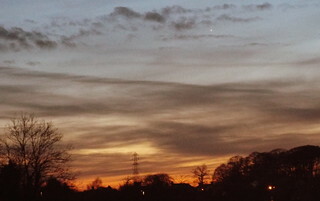 Noticed this star at 20:23hr (still quite light) almost due West of Carlisle last night - any suggestions? Looking at Stelarium Andromeda, Aries and Cassiopeia all seem possibilities. It is a bright object. That rules our stars of Aries ans Andromeda. The main five stars of Cassiopeia are brighter but are of similar magnitude so I would have thought that if one was visible, the others would be too. Venus is in the west about this time, but it would be much closer to the horizon. I think it could be Aldebaran, the brightest star in the constellation of Taurus. It is a bright star (around magnitude 1) as you shot shows and it is in roughly the right position. The 'problem' is Aldebaran is an orange giant and is usually noticeable reddish in colour. However, the apparent colour could have been affected by the cloud and the lightness of the sky. Makes sense - thanks for that.